Most of the cats in town usually are lazy, but one I found seemed to be actively attacking things. It was found attacking Myrm Protectors, the large red ants, in north side of town. 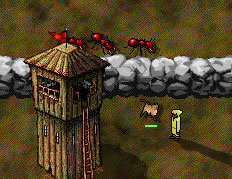 After somebody came by and defeated the Myrms on the stone wall, it started to wander around town attacking rats and vermine. Shame the poor thing took on three Myrm Protectors in east side of town and was defeated. One of the interesting features of Mabinogi is the ability to play as your pet. This dragon sometimes finds strange and interesting things in town. Before anybody ask me about it, I didn't sneeze in town. 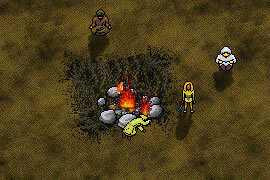 Clan Lord is a very open ended 2D MMO game using old Apple computer 8-bit color graphics. It use to be only for Apple computers til a PC version was created. Because of the open ended nature of this game, this dragon has to create his own quests. My first quest would be find a juicy cow to eat. 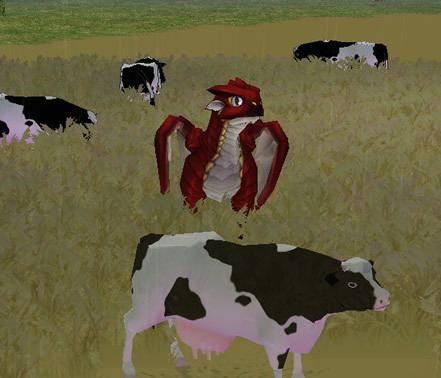 There has to be a cow some where in this game. The second quest would convince Corstun, a Trrsin costume shop NPC, let me keep my dragon costume. A dragon wants to stay a dragon. My third quest will find a comfy cave to live instead this short life place I have to endure sleeping in. Lastly, I need to find somebody to replace that clothing dummy in my place with something more dragonish. 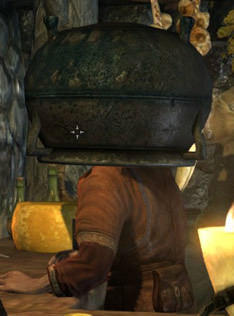 Finding a cool feature in Skyrim means I try it out on a short life's head. Now, I just need a big hammer.